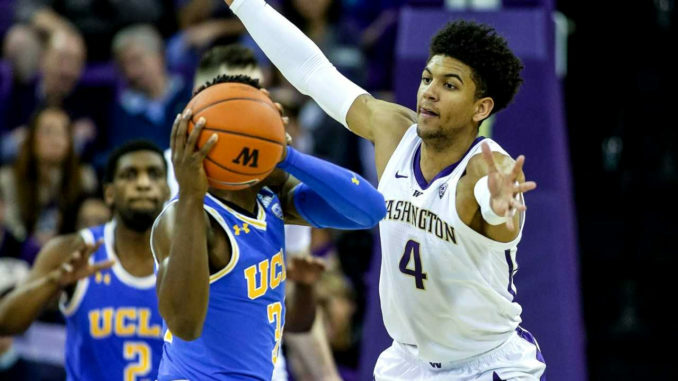 After years of underwhelming basketball that included a 9-win season, the Washington Huskies this season have finally returned to the Big Dance, March Madness. The program has experienced a resurgence after Coach Mike Hopkins’ arrival. After being a long-time assistant at Syracuse, Hopkins moved to Montlake in 2017. He also took with him a defensive philosophy that made Syracuse a mainstay in the Big East. For a team like Washington whose average height is around six-foot-five, length is key in running a zone; it allows them to employ players to disrupt opposing offenses. Jaylen Nowell, who’s the reigning Pac-12 Player of the Year, led the team in scoring with 16.2 points per game. Much of the scoring is done in the mid-range, hitting an efficient 52.5 percent from the field. Senior guard Matisse Thybulle is the most accomplished Husky on the team. The Issaquah native has led the PAC-12 in steals for three straight seasons, and even this season lead the NCAA with more than three steals a game. This season he passed Gary Payton for first all-time in steals in the conference, netting 330 in his career. Noah Dickerson, another four-year guy, is a power forward that hails from Atlanta, GA. The six-foot-eight Dickerson has scored over 1,500 points in his career, and is a double-double machine that does his work inside. David Crisp, a six-foot guard out of Tacoma, functions as the team’s floor general. Despite his role, he’s not shy to let it fly from deep, hitting over 700 three-pointers in his career. Underclassmen such as Nahziah Carter and Hamier Wright have been pesky on defense and provide energy off the bench. With a roster boasting a decent mix of veteran leadership and talent, UW had the makings of a Pac-12 contender. The pre-season polls had the Dawgs finishing third in the conference, behind teams like Oregon and UCLA. The Huskies early on had a shaky start, as they had a tough non-conference schedule battling heavyweights like Gonzaga and Auburn on the road. Their Gonzaga matchup was a nice sign, as the Huskies gave the Zags all they could handle in an 81-79 loss. In conference play, they went 15-3 and won the conference outright. This included sweeping their rivals in Arizona and UCLA. Despite losing the conference tournament championship to Oregon, and a second round loss to UNC, UW’s future looks very bright. Next year’s recruiting class features blue chip recruits like Isaiah Stewart and there’s rumblings of Jaden McDaniels signing as well. Hopkins is building something special in the Northwest, one step at a time.